Autophagy functions as a cellular recycling and quality control pathway to provide necessary building blocks for essential de novo biosynthetic pathways during stress and to restrict accumulation of cellular damage. Remnants of autophagic activity are found in Parkinsonian brains, although whether this is a result of too much or failed autophagic activity is not clear. One critical function of autophagy is the maintenance of viable mitochondria; either through elimination of damaged mitochondria following fission through mitophagy or by indirectly increasing mitochondrial fusion to promote complementation and maintain fidelity in oxidative phosphorylation. Elimination of damaged mitochondria is associated with the accumulation of the protein kinase PINK1 on the surface of damaged mitochondria, which in turn recruits the E3-ligase Parkin, which ultimately results in decoration of damaged mitochondria with ubiquitinylated epitopes, marking them for autophagic engulfment. PINK1 also directly engages with the autophagy machinery in a novel mechanism that enhances autophagy activity by modulating the activity of the Beclin1/hVps34 complex. 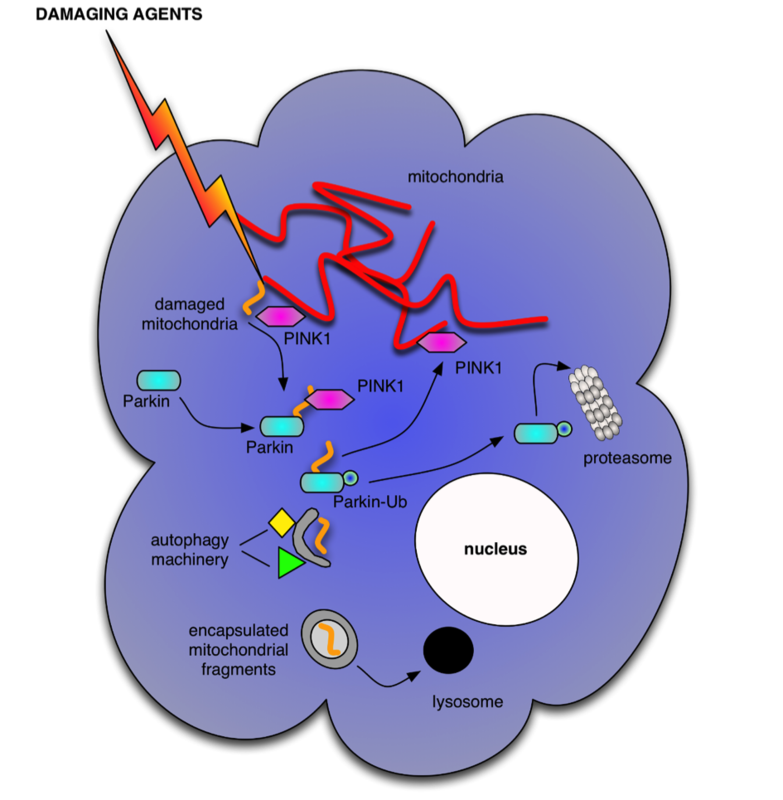 The project continues to explore the molecular mechanisms that integrate signals for selective degradation of mitochondrial components by the autophagy and proteosomal machinery in the context of Parkinson's disease. I have been trained in cell culture, Western immunoblotting, immunoprecipitation, shRNA purification and lentivirus-mediated shRNA gene silencing. I will be trained in microscopy as well. The other TINTIN fellows that are based in Dublin and me are planning on writing an article about our experiences as foreign students doing their PhD in Dublin and how this has been made possible by the TINTIN program. This article will go out to everyone in Trinity College Dublin and will hopefully inspire some of the undergraduate students to do the same.